Olympus D-590 IR-500 Mju 10 Mju 20 Mju 300 Mju 400 Mju 410 Mju 800 Mju Ferrari,U810. Olympus Stylus 300 Stylus 400 Stylus 410 Digital Stylus 500 Stylus 600 Digital. Olympus u (Mju) Digital 500 u Digital 500 u Digital 800 u-15 Digital u-25 Digital U-30 Digital u-40 Digital. Battery Type : Li-ion. Warranty: Full One Year ( 12 Months ). for SANYO DB-L80 DB-L80A DB-L80AU DB-L80U. for Sanyo VPC-CG10Series. for Sanyo XactiDMX-CG11Series. for Sanyo XactiVPC-CG10Series. Battery Type Lithium-ion (Li-ion). With regards to batteries the warranty does not cover cell depletion. A battery that still holds 80% of its capacity after 12 months is considered to be normal. We are most happy to help! Sanyo Xacti VPC-A5. Battery Type Lithium-ion (Li-ion). With regards to batteries the warranty does not cover cell depletion. A battery that still holds 80% of its capacity after 12 months is considered to be normal. Μ-15 Digital, μ-20 Digital, μ-25 Digital, μ-30 Digital. - μ 1000, μ 600, μ 800, μ 810, μ Digital 500, μ Digital 600, μ Digital 800, μ-10 Digital. - μ-300 Digital, μ-40 Digital, μ-400 Digital, μ-410, μ-410 Digital, μ-Ferrari. Fit to the device models:Sanyo Xacti DMX-C1, Xacti DMX-C4(D), Xacti DMX-C4(L). RoHS Approved for toxic free. Compatible with the battery part numbers:DB-L20, DB-L20A. 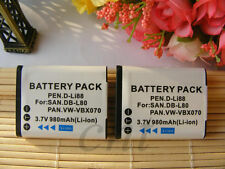 Capacity 720mAh. Sanyo Xacti E60. Sanyo Xacti DMX-C Series. Sanyo Xacti DSC Series. Sanyo Xacti VPC Series. Battery Type Lithium-ion (Li-ion). WEEE & Waste Portable Battery Regulations. We are most happy to help! Xacti VPC-TH1, Xacti VPC-TH1BL, Xacti VPC-TH1EX-B. Xacti VPC-TH1EXBL-B, Xacti VPC-TH1EXR-B, Xacti VPC-TH1R. Xacti VPC-WH1, Xacti VPC-WH1BL, Xacti VPC-WH1EXBL-B. Xacti VPC-WH1EXW-B, Xacti VPC-WH1EXYL-B, Xacti VPC-WH1YL. Panasonic HX-DC15. Panasonic HX-DC Series. Battery Type Lithium-ion (Li-ion). Panasonic HX-WA Series. We are most happy to help! Sanyo Xacti VPC-CG20 Series. Xacti VPC-CG10EXW-B, Xacti VPC-CG10P. HX-DC3GK, HX-DC3K, HX-DC3R, HX-DC3W. LI-42B, NP45. Sanyo Xacti VPC-E1403. Sanyo Xacti VPC-E1403EX. Sanyo Xacti VPC-E1500TP. Sanyo Xacti VPC-T1495. Battery Type Lithium-ion (Li-ion). With regards to batteries the warranty does not cover cell depletion. Fit to the device models:Sanyo Xacti VPC-E1403EX, Xacti VPC-T1495, VPC-E1403. RoHS Approved for toxic free. All batteries are certified with CE and ISO9001. Panasonic HX-DC15. Panasonic HX-DC Series. Panasonic HX-WA Series. Fit Machine Model We are most happy to help! Toshiba Camileo SX900. Toshiba Camileo SX500. Toshiba Camileo BW10. EasyShare DX6490, EasyShare DX7440. EasyShare DX7440 zoom, EasyShare DX7590. EasyShare DX7590 zoom, EasyShare DX7630. EasyShare DX Series. EasyShare P712, EasyShare P850. EasyShare Z730, EasyShare Z730 zoom. Replace Code NP-40, UF553436. NP-40, UF553436. Sanyo Xacti VPC-E1075. Sanyo Xacti VPC-E1090. Sanyo Xacti VPC-E760. Sanyo Xacti VPC-E760GL. Sanyo Xacti VPC-E760P. Sanyo Xacti VPC-E860. Panasonic HX-DC15. Panasonic HX-DC Series. Panasonic HX-WA Series. Battery Type : Lithium-ion (Li-ion). Otherwise, communication is impossible in case it is necessary. For the following ZIP CODES,ZE, IV and AB31-38, AB41-56, FK17-21, G83, KWO, PA39-40, PA50-59, PA80, PH15, PH27-29, PH45-48, PH51-99. Casio Exilim EX-S8 Series. Exilim EX-S7BK, Exilim EX-S7PE. Casio Exilim EX-S7 Series. Exilim EX-S6SR. Exilim EX-S6BE, Exilim EX-S6BK, Exilim EX-S6PK. Casio Exilim EX-S6 Series. Exilim EX-S5SR. Exilim EX-S5, Exilim EX-S5PK. Model numbers fit to: Sanyo Xacti VPC-WH1, Xacti DMX-HD2000, Xacti VPC-HD1010, Xacti VPC-HD1000, Xacti DMX-WH1, Xacti VPC-HD2000, Xacti DMX-HD1010, Xacti DMX-FH11, Xacti NV-SB360DT, Xacti VPC-HD2000A, Xacti VPC-FH1, Xacti VPC-FH1A, Xacti VPC-WH1, Xacti VPC-TH1. Capacity 700mAh. Sanyo Xacti VPC-E1403. Sanyo Xacti VPC-E1403EX. Sanyo Xacti VPC-E1500TP. Sanyo Xacti VPC-T1495. Battery Type Lithium-ion (Li-ion). With regards to batteries the warranty does not cover cell depletion. VPC-C40, VPCC40, C40. DSC-E6, DSCE6, E6. VPC-E6, VPCE6, E6. VPC-E2, VPCE2, E2. VPC-S7, VPCS7, S7. DSC-C4, DSCC4, C4. VPC-C4, VPCC4, C4. VPC-E7, VPCE7, E7. Panasonic HX-DC15. Panasonic HX-DC Series. Panasonic HX-WA Series. Battery Type Lithium-ion (Li-ion). WEEE & Waste Portable Battery Regulations. Product Information. We are most happy to help! G oogolpower. Capacity 1100mAh. Sanyo Xacti DMX-SH11. Sanyo Xacti DMX-SH11K. Sanyo Xacti DMX-SH11R. Sanyo Xacti VPC-SH1. Sanyo Xacti VPC-SH1BK. Sanyo Xacti VPC-SH1EXBK. Sanyo Xacti VPC-SH1EXR. Fit to the device models:Sanyo Xacti DMX-HD1, Xacti DMX-HD1A, Xacti DMX-HD2. RoHS Approved for toxic free. Compatible with the battery part numbers:DB-L40, DB-L40A, DB-L40AU. All Inov8 batteries are fully tested and built with lithium-Ion technology to ensure maximum power and battery life. Inov8 batteries let you work seamlessly when you are on the move. Uses lithium-Ion technology to ensure maximum battery life and power. Capacity 700mAh. FinePix F402, FinePix F403, FinePix F420. FinePix F455, FinePix F455 Zoom, FinePix F460. FinePix F460 Zoom, FinePix F470, FinePix F470 Zoom. FinePix F480, FinePix F480 Zoom, FinePix F610. Sanyo Xacti VPC-HD1000. Xacti VPC-TH1, Xacti VPC-TH1BL, Xacti VPC-TH1EX-B. Xacti VPC-TH1EXBL-B, Xacti VPC-TH1EXR-B, Xacti VPC-TH1R. Xacti VPC-WH1, Xacti VPC-WH1BL, Xacti VPC-WH1EXBL-B. Xacti VPC-WH1EXW-B, Xacti VPC-WH1EXYL-B, Xacti VPC-WH1YL. 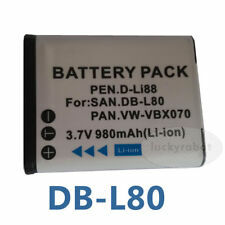 Compatible with the battery part numbers:DB-L20, DB-L20A. NP-40, UF553436. Sanyo Xacti VPC-E1075. Sanyo Xacti VPC-E1090. Sanyo Xacti VPC-E760. Sanyo Xacti VPC-E760GL. Sanyo Xacti VPC-E760P. Sanyo Xacti VPC-E860. Sanyo Xacti VPC-E870. Genuine Olympus accessory. 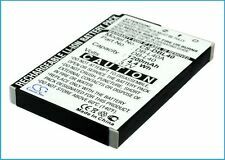 Fits Olympus & SANYO models using LI-10B & LI-12B battery Olympus D-590 IR-500 Mju 10 Mju 20 Mju 300 Mju 400 Mju 410 Mju 800 Mju Ferrari,U810. Olympus Stylus 300 Stylus 400 Stylus 410 Digital Stylus 500 Stylus 600 Digital. Model numbers fit to: Sanyo Xacti VPC-CG10GX, Xacti DMX-CG10, Xacti VPC-X1200, Xacti VPC-CG10BK, Xacti VPC-CG10P, Xacti VPC-CG10, Xacti VPC-CS1, Xacti VPC-CG100, Xacti VPC-GH1, Xacti VPC-CG20. Battery Type: Li-ion. Xacti DMX-C1,Xacti DMX-C4(D). Xacti DMX-C4(L), Xacti DMX-C4(N). Xacti DMX-C40(S), Xacti DMX-C5(S). Xacti DMX-C5(T), Xacti DMX-C5(W). Sanyo Xacti E60. Sanyo Xacti DMX-CSeries. Xacti DMX-C6(K), Xacti DMX-C6(R). Capacity: 680mAh / 2.5Wh. Compatible to models: Sanyo Xacti DMX-E10, Xacti VPC-E10. RoHS approved for toxic free.